Eugene Hoshiko, J. Scott Applewhite/APFederal Reserve Vice Chair Janet Yellen, left, and former Treasury Secretary Lawrence Summers. NEW YORK -- A new chairman is just the beginning of what could be a big leadership change at the Federal Reserve next year, giving investors yet another reason to second-guess the U.S. central bank's plan to scale back its support for the economy. Up to six officials who would otherwise vote on monetary policy, or half of the central bank's voting ranks, could conceivably be gone in 2014, most of them by the end of January. Five of those, including Chairman Ben Bernanke, sit on the Fed's seven-member Board of Governors, setting the stage for a whole new cast of characters to run the world's most influential central bank and giving President Barack Obama a chance to put a big stamp on it. 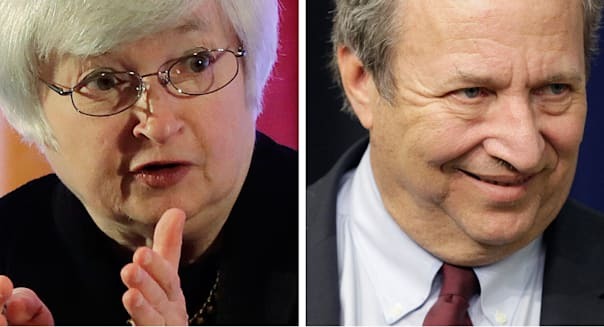 The face of the Fed could be even less familiar if Bernanke isn't succeeded by Vice Chair Janet Yellen, a policy dove who appears to be in a tight race for the top job with former Treasury Secretary Lawrence Summers, whose views are less known. Wholesale changes could raise questions in the marketplace over verbal promises the Bernanke-led Fed has made to keep interest rates low in the years ahead. Still, analysts and Fed officials don't expect abrupt changes in the central bank's policy path, including its plan to end a massive bond-buying program by around mid-2014. "All the forward guidance the Fed has put out in recent months and years is predicated on the leadership and the people being there," said Roberto Perli, a partner at research firm Cornerstone Macro and a former senior officer at the central bank. "Having so many people changing I think is a source of additional uncertainty in the market." The last thing the Fed wants to do is surprise investors. In June, officials were startled when market rates shot higher after Bernanke said the central bank aimed to start trimming its $85-billion-per-month in bond purchases later this year. Today's policy-making Federal Open Market Committee, made up of the seven board members, the head of the Federal Reserve Bank of New York and four other rotating regional Fed bank presidents, has also committed to keeping rates near zero at least until the unemployment rate falls to 6.5 percent, as long as inflation stays under control. And in another pledge that would tie the hands of successors, Bernanke has said a "strong majority" of the FOMC don't expect to sell mortgage-based assets in the longer run. But it is unclear whether the next generation of policymakers will conform to the promises made in the wake of the Great Recession, and some analysts say the uncertainty has already pushed bond yields higher. Governors a Reflection of the Chief? Bernanke is expected to step down when his second four-year term as chairman ends on Jan. 31. If Yellen doesn't get the job, economists expect her to leave when her term as vice chairman ends in October, even though her separate board term doesn't expire until 2024. Governor Elizabeth Duke, who joined the Fed as the financial crisis worsened in 2008, is retiring at the end of this month, while Governor Sarah Raskin has been nominated to take a top post at the U.S. Treasury. The term of Jerome Powell, a Republican who became a Fed governor last year, also expires at the end of January, although he could be reappointed by Obama. Rounding out the six, Cleveland Fed President Sandra Pianalto, who becomes an FOMC voter in 2014, has said she will retire early next year. The unusually heavy turnover means Obama could overhaul the central bank even more than former President George W. Bush did in 2006, when Bernanke replaced Alan Greenspan, two governors left, and three more arrived. Obama is expected to name his Fed chairman nominee this fall. His picks for governors would likely come later and analysts said the new chairman would probably have a big say. Past public comments suggest a Summers-led Fed might be somewhat quicker to raise interest rates and less likely to use extraordinary measures such as bond-buying in the future, than would a central bank led by Yellen. While some are more influential than others on the direction of policy, Fed governors almost always back their chairman. But analysts say Summers' domineering personality could shake up the democratic and consensus-based FOMC that Bernanke built and that Yellen would likely continue. "I would not be as focused on the change if Yellen came to get the job. It's a group that's been working together a long time," said Karim Basta, chief investment strategist at III Associates, a $2 billion hedge fund. "But if that's not the case, with over one-third a new committee, with a new chairman, that does change things a lot."